Alliance, Box Butte County, Neb. Vol. 9, no. 9 (Feb. 21, 1902)-v. 29, no. 62 (June 30, 1922). "Official publication of Box Butte County." 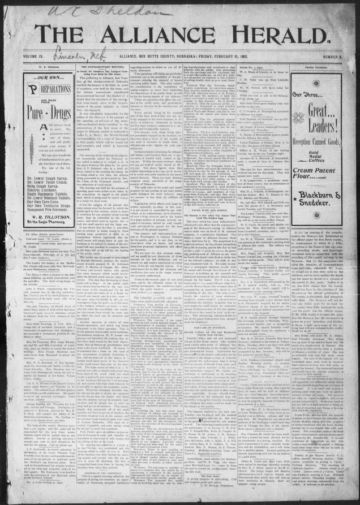 The Alliance Herald (1902-1922) was owned and edited by Thomas J. O'Keefe, who had years of experience editing newspapers in Hemingford, Nebraska. Beginning in 1902, the slogans bordering the Alliance Herald's masthead included the "official publication of Box Butte County" and the "largest circulation of any Alliance paper." Both the large circulation rates and a county contract to print legal notices enhanced O'Keefe's publication. The Herald never lost its strong focus on both agricultural and civic affairs. Promoting local patrons' prosperity, building up business interests, and boosting the development and settlement of western Nebraska also remained goals of O'Keefe, who used the paper for civic betterment. The paper ran comparative charts of livestock and produce prices in major cities nationwide, along with stock brands to inform farmers on trends, developments, and competition. Published weekly on Fridays, the paper cost $1.50 for an annual subscription. The paper had six columns on each of its eight pages. Under O'Keefe's direction, the Alliance Herald became one of the leading papers in northwest Nebraska. In January 1905, O'Keefe sold the Alliance Herald's entire operation to W.S. Raker, who had formerly edited another newspaper and also had been a postmaster and insurance agent. Raker, who lent some Republican ideals to the paper, also embraced boosterism to grow the town, while widening coverage. Key national and world events most often reported on over the years included the inauguration of Theodore Roosevelt as president for a second term in 1905 and the Russian-Japanese war (1904-05). Other national issues covered were the passage of the Pure Food and Drug Act and the designation of national forests. Women's struggle to vote appeared, too, with the paper's Chicago correspondent Beverly Brux writing a piece "Woman Suffrage Stirs Chicago." The two foreign countries that seemed to receive the most coverage by the Alliance Herald were Cuba and Russia. Russian coverage included the first violent actions by common workers against the royal family; a few years later the Bolshevik revolution would triumph. One local issue of great importance was the lack of a sewage system for Alliance, which was ultimately resolved in the city council; the city's water resources were also discussed in relation to a desire to put a metering system in place to reduce costs for people who paid for city water. O'Keefe suddenly repurchased the paper from Raker on June 15, 1905. His only explanation was that he had returned from an extended break. After regaining control, he did away with Raker's Republican slant and edited it as a politically independent paper. Although the paper was owned and edited later by others, the Alliance Herald's popularity never seemed to waiver and its increasingly thorough state, national, and world coverage continued, while simultaneously retaining its focus on developments in the town of Alliance.